Paranjpe’s film, which I first saw more than 20 years ago on Doordarshan, is a beautifully scripted and acted story based loosely on the fable of the hare and the tortoise. After a cutesy title sequence (with an animated rendering of the tale), we meet our tortoise, Rajaram (Naseeruddin Shah), an honest, likable young man who works as a filing clerk at a shoe company. Rajaram stays in a Mumbai chawl that’s the picture of communal living; many families packed together in a small space, all on friendly terms, sharing food and gossip. He’s in love with his neighbour Sandhya (Deepti Naval), but true to tortoise form he keeps stumbling over himself and missing the opportunity to voice his feelings. Then his suave, opportunistic childhood friend Bashudev (“call me Bashu, it’s more stylish”), played by Farooque Shaikh, shows up unannounced and coolly moves in with him. Bashu secures free meals at posh restaurants, charms the other chawl-dwellers, smooth-talks his way into an administrative job in the company Rajaram works for…and eventually sets about wooing Sandhya and her parents. All the while, Rajaram continues plodding along in his own way, convinced that everything will come to he who waits. Katha is mostly narrative-driven – it’s the sort of film where you get absorbed by the story and the characters without thinking much about the technicalities – but it’s also a very playful movie with some funny sight-gags: such as a scene where the sound is turned off and a large “Censored” splattered across the screen while a dirty joke is being told. And a couple of dream sequences that play like spoofs of the mainstream cinema of the time. In one, Rajaram is molested by a gang of cackling shrews (women from his office) and a jhaadu-wielding Sandhya comes to his rescue; in another, Bashu and the delightfully pixie-ish Jojo (played by Winnie Paranjpe, the director’s daughter) perform a disco-style variant on the song “Tum Sundar Ho” (which is used as the theme for the hare’s wooing of various women). Even Mithun-da might have blushed at the shiny vest worn by Farooque Shaikh in this scene; it’s fun to see these doyens of “parallel cinema” clowning about in this way, and Paranjpe keeps giving us entertaining asides that don’t have much to do with the main plot but which make the film very enjoyable. Despite appearances, Katha isn’t a straightforward morality tale about the Good (read: slow and steady) guy winning in the long run. In the very first scene of the film an old lady, narrating stories to her grandchild, cautions him that in the real world you rarely have the tortoise winning the race, and the rest of the film expands on this idea. Balancing your personal ideals with the practical demands of living in an imperfect world…these are the real concerns of this story, which raise it above the romanticism of the fable it’s based on. For instance, Paranjpe makes it a point to show us at the film’s end that both protagonists have achieved what they wanted. Even when Bashu is exposed as a cheat, he walks nonchalantly out of the office, twirling his key-pouch around his finger (“my sudarshan chakra,” he calls it), a thoughtful look in his eyes – he’s already planning his next strategy. The last time we see him it’s in a plane heading for the Gulf, presumably to continue conning and sweet-talking his way through life. A director whose primary concern was to provide a moral lesson would have ensured that the character got his comeuppance, but Paranjpe’s approach (much like Satyajit Ray’s) is more gentle – built on exploring shades of humanity in various characters rather than turning any of them into outright villains. Of course this doesn’t mean that the viewer should condone some of the things Bashu does (especially his final act of seducing Sandhya and then leaving her on the wedding day), but he also serves as a medium for Rajaram to learn valuable lessons about pragmatism. What this film is really about is the development of the tortoise. Though he’s the good guy, on more than one occasion Rajaram comes across as plain silly in his idealism – at times you want to give him a good shaking or at least clip him across the ear. I’m thinking in particular of the scene at the bus-stop where he keeps up a steady, self-righteous rant about people who jump the queue, and the general insensitivity of the world. Here one gets the sense of a character who’s so bent on exposing others’ shortcomings that he fails to understand his own, and rarely makes a serious attempt to be pro-active. And Rajaram does learn his lessons. Our final indication that he’s grown as a person and learnt not to look at the world through rose-tinted glasses comes in the scene where he offers to marry Sandhya after Bashu’s disappearance. She tells him she’s no longer a virgin; he looks down, visibly upset, but then raises his head and tells her that it doesn’t matter to him. I don’t think the Rajaram we met at the beginning of the film, well-meaning though he was, would have been capable of such maturity. He would have been hampered by his unreasonable expectations of people and his firm views about how things should be. But by the film’s end the tortoise has emerged from his shell, and the hare is at least partly responsible for this. I guess the tortoise does come to realise his 'handicap' soon enough and is even jealous of the hare's ways with women, particulary Sandhya. He fancies himself as a confident Bashu, complete with key-chain twirling, tricking Sandhya to make tea for him... which remains a short-lived day-dream. Lovely movie. I've never seen it. Where does one go for these movies on the internet? It's been ages since I saw this, but I'm not sure about Rajaram being "convinced that everything will come to he who waits". From what I remember of the film, Rajaram is just resigned to the fact that he doesn't have what it takes - isn't there a scene that involves Sandhya coming over and wanting tea and Rajaram has this fantasy about telling her to make it, which Bashu actually does? On the whole, I'd say Rajaram's character is more about personal integrity than any conviction that such integrity will get him what he wants. At best, he believes that by sticking to his principles he will get what he deserves, but this need not be what he wants. By the same token, I'm unconvinced that Rajaram's final acceptance comes from 'maturity' - I'd categorise it more as humility - the belief that he should accept what he gets and be grateful for it, having little right to demand anything more. Just my interpretation, of course. And as I said, it's been a while. Seen this movie zillions of times on Zee Cinema till their first internminable ad break starts. Love the movie though never thought of Bashu as "a guradian angel", my thoughts being more along the lines of the "heroine sleeps with the hare, but marries the tortoise". Nice analysis, sire! This really makes one sit back, think and ponder over the lessons of growing up. I'm surprised you did not find the little bit about the newly-weds remark-able, within the context of the movie. That was a nice post. For those of us who grew up in the eighties SAi Paranjpe's movies like "Katha" are replete with moments which truly capture the spirit of that time. Not just specific images but the innocence and a basic goodness pervading the characters of her films. I never saw the movie, but interesting twist in the tale in the end. Reminded me of a Somerset Maugham story, where he makes sure that the Hare wins (i.e. : marries a rich widow, who conveniently dies). I had this series of short stories by Maugham and the plays based on them, where he mostly took fables and twisted them around. Anyone else who has done this? I have not seen the movie, but farooque still looks good, there is this new comedy which has started in which he is acting , cant recall the name right now, will post it as soon as i can. After reading this, iam sure i would like to watch this movie. Iam sure its a interesting movie. Those were good ole days ! One of those feel-good movies of 80s. 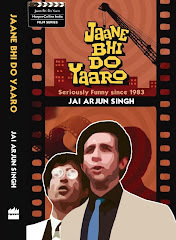 Another one was Chasm-e-Baddoor, a predecessor to Dil Chhata Hain, sort of, I say. Sai movies/tele-serials were real good. Nikhil: quite a few modern authors have done that. Also bear in mind that many fables, fairytales etc were considerably altered/toned down in the first place and reached us in a very different form from the originals. Not the hare-and-tortoise one though! Falstaff On the whole, I'd say Rajaram's character is more about personal integrity than any conviction that such integrity will get him what he wants. In addition to integrity Rajaram exhibits some traits of a 'rescuer personality.' His ability to take on the problems of everyone onto himself also leads him to never want to say no to folks from his chawl as well as other secy's from work. And this is where I disagree with Jai about Rajaram learning his lessons. He rescues Sandhya as well, but that is what he finally wants, for once in his life. Sai brings out the subtle difference between his lack of ambition (primus stove, minimal luxury in his apt) versus that of the son of Bal Karve who is never shown, but his ambition for his family is very visible (fridge, fancy furniture, imported beer etc). Rajaram does move out of his village to seek his fortune in Pune, but his parents support him and not the other way around. [Notice the contrast between the home of Rajaram's parents with Bal Karve's. Rajaram is clearly a first-gen migrant and retains old world values possibly inherited from his village]. For Bashu, people are simply means for achieving his ambitions - quite like Mallika Sarabhai's character who is clearly married for the sake of money & prestige. Another element that tends to be forgotten is caste. Kannada and Marathi plays and films are quite explicit in their display of caste, but often, only insiders from those communities can get such references. Naseer and Deepti are clearly brahmins (last names Joshi and Karnik) - simple, religious and upright, while Bashu does not have a last name (why? ), and is clearly not a Maharastrian. [Incidentally, Sai's grandma was Russian]. Kannadigas and Maharastrians (esp brahmins) often lament that they do not have the ruthlessness of "north Indians" to succeed in business etc - which is one reason why S.L. Kirloskar and Narayana Murthy are revered by the two communities. I thought Sai was commenting on that aspect as well. 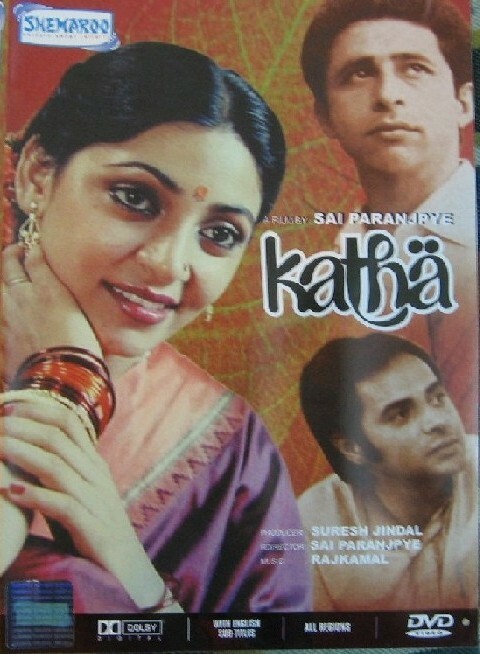 Btw, the cast of Katha comprises of Marathi stage actors, some of whom were quite well known. The chap who plays the role of Deepti's father is Arun Joglekar, ex-husband of Sai Paranjape and father of Winnie. The film was shot in Pune. Quizman: thanks for the info. Also, how come the film's credit titles were only in Hindi? I think all of Sai's films have credits in Hindi. I definitely recall C-e-B credits in Hindi. That's a thing about Maharashtrians - even Amol Palekar, iirc, displays credits of his films in Hindi. Makes eminent sense to me. Credits are quite important in Sai's films since they contain a lot of inside jokes. Note that the producer of C-e-B was Lakhanpal, the name used by Ravi Baswani while courting Deepti ("Aapne mashoor producer D. K. Lakhanpal ka naam suna hoga. Mein unka chota bhai hoon." - Deepti shakes her head. The unit must've ROFLED while crafting this scene. I've seen C-e-B close to 33 times and have found something new to laugh at each time I've seen it, right from the classic Mir Taqi Mir ghazal rendered by Mehdi Hassan 'ye dhuaa.N saa kahaa.N se uThataa hai', while the trio are smoking to the final credits! The chap who plays the role of Deepti's father (who checks her head when she talks about Keynes' 'General Theory..' being a majedaar kitaab) is industrialist Vinod Doshi of Premier Automobiles. Another famous role played by him is that of Dhritrashtra in Shyam Benegal's 'Kalyug'. 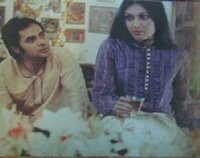 It's said that Sai Paranjpe named Farooq Shaikh's character after Basu Bhattacharya after she got a bit annoyed about the delay of the release of her previous film Sparsh which was produced by Basu B. Just came across your blog. Great review... it was a delightful film, I had watched it long time ago, and had almost forgotten the film. Very interesting discussion in the comments. loved your post - it's one of my favourite movies. i think sai paranjpye made some gems, pity she stopped. i saw katha again recently after my childhood and this time i saw the end differently - probably because of adult eyes. there is this sense in the end that he got short-shrifted (the mausi saying, bhala yeh bhi koi jeet hai) - but apart from the fact that he loves her, i also felt he was a bit culpable in bashu's fraud. in the indian scenario, the groom derives much of his respectability from whom he knows. by keeping silent about bashu's frauds - saying nothing when the bride's family thinks he is london-returned, not revealing that bashu plans to flee when bashu hints at it - i think rajaram picked his loyalties - he chose to be loyal to bashu even when bashu let down his company, his neighbours and his love - so did he really have integrity? or was he a wimp with a twisted sense of what is right - his acceptance of sandhya in the end is partly love and partly responsibility.
" I don’t think the Rajaram we met at the beginning of the film, well-meaning though he was, would have been capable of such maturity. He would have been hampered by his unreasonable expectations of people and his firm views about how things should be. But by the film’s end the tortoise has emerged from his shell, and the hare is at least partly responsible for this. " Great movie, but I'm not sure I agree with this. As some other posters have mentioned, it is an act of resignment stemming from an awreness of one's own limitations -Naseer's acceptance of Sandhya comes at a cost and with the distinct feeling that he was never her first choice. But sometimes, life is about compromise and convenience - like it is for Dipti Naval's chatacter too! Great movie but its lost with the old DD days.. zee cinema is there with repated shows of mass and flop films.. where is the scope of Katha in this kind of stopwatch world. Watched this movie again on youtube yesterday. It's still very entertaining. But in reality, we rarely come across Rajarams or Bashus as portrayed in the film. Instead, most people we meet are likely to have characteristics of both Rajaram and Bashu. A black and white rendering of the characters seems a little cartoonish, nevertheless enjoyable. A slightly more nuanced version of the hare and tortoise tale is the 1941 James Cagney starrer - The Strawberry Blonde . Great fun. Though even that film doesn't boast of as many visual gags as Katha. An amazing movie....light, feel good, and fresh....genuinely funny, and of course, the acting was...par excellent! When I see the so called comedies doled out by Bollywood today(welcome, no entry etc.... ye gads!!! )makes you wonder why Indian filmmakers cant make comedies like they used to! @ The last Anonymous, the comedies do exist, check out Andaz Apna Apna & HeraPheri, boh are wonderful commentary on society's quick buck tendency. iV) The heroine is Sabnis, not Karnik. I gather that is a Brahmin name, too. I read somewhere that originally Paranjape had planned Nasir to play Basu and Sheikh to play Rajaram (looking at the homely characters played by Sheikh in films like Aas-Pass and more urban characters played by Nasir like Akrosh). The actors spoke to her about trying the alternate and both did a fantastic job!